All About the ALSOPS: Happy Belated Birthday to our 6 year OLD!!! Happy Belated Birthday to our 6 year OLD!!! Kylee turned 6 about a month ago and we had a great time celebrating. I thought this year might just be a small little group since we have only been in the area for a year but she has made some great friends and had her party idea a couple months in advance. I thought the idea might fade away as I was unsure how to pull her idea off...but with some help from the Internet, brainstorming from me and Kylee and some helpful sewing from grandma and Ky we pulled off the BEST DOG/CAT party ever! The "AMEWSING ALSOP PET CENTER" was ready for a HOWLING GOOD TIME! Kylee's 8 friends showed up with their favorite Dog or Cat stuffed animal ready for some DOGGONE FUN and had a PURR-FECT TIME! 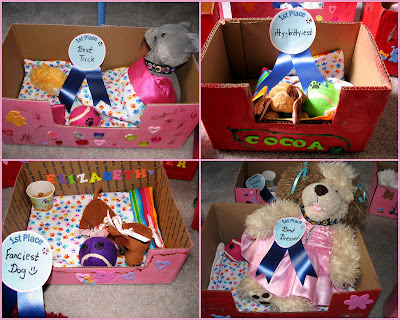 We started off with our craft where everybody decorated their own animal bed and was given a sleeping bag to go inside which Kylee and her Grandma had made for each girl a few weeks before. She had a blast picking out the fabric and taking great care of them up till the party. They then moved on to making fancy collars and to the grooming station. 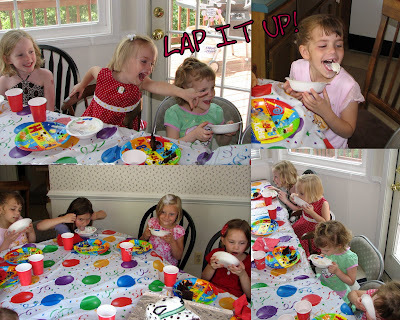 -Dancing to "Who let the Dogs Out"
Our Dog shaped cake was served and the girls had a blast lapping up their ice cream as no one was given a spoon to go along with it. This was a definite hit and got some great reactions. Alexis especially loved it or should I say pointing out what was on someone else's face. The girls meowing and howling during "Happy Birthday" was a great personal touch they added and planned out all on their own. Kylee continues to be an animal lover and has had a blast this year taking car e of her Webkin Cat "Keena". This was definitely a Kylee party and we had tons of her own Dog a Cat stuffed animals to use as decorations. She is growing up so fast which we all say every year but I have really noticed it as I reflect on her first year of school. We are so proud of her and thankful to have her in our family. We continue to love her smile and true laugh. We think she is so dang pretty and get a kick out of watching her enjoy being TRENDY! (i was shocked the first day i heard her use this word) She is still our shy little girl in any new situation she is found in but once fully comfortable (which in a some cases can take a long time) she emerges takes the reins and is found organizing and making sure everyone gets an equal turn. She truly does have a love for LIFE and tons of Mothering instincts. Her big interests this past year have been fairies, playing with friends any moment possible, collecting gems and all sorts of treasures, playing pretend school and as always finding new interesting pets. -Hates going somewhere in the house where someone isn't and has discovered several ways to get her sister to go along with her on any quick errand she needs...even if they are sleeping together she will wake Lexi up and send her to go get Mom or Dad. Holy Cow Girl! Once again, I am truly impressed with the party planning skills. You pulled it all off amazingly! You had quite the crew. I love the dog beds and sleeping bags. They are darling! You even pulled off the cute cake. The treats are fantastic. They look so real. The awards, the games, the facial expressions of the girls - everything is awesome. Happy birthday Kylee! You have a great MOM! Awesome! What a cool party!! I wish I were better at that stuff...Kylee really is lucky to have such a fun mom. :) What a sweetie! Can you believe Kylee and Justin are 6!? Wow! that is the cutest birthday party ever. How creative. I love the cake. HOLY COW GIRL!!!! You are AMAZING!!!! The cake, the games, the ideas!! WOW! And a late Happy Birthday to our Kylee!!! We miss and LOVE you!! We love her too and the girls sure loved the party. It really was "purr"-fect! I love all the things you notice about Kylee, she is such a smart, fun, beautiful girl and we sure miss her! Alright! I am calling you when it is time to plan my boys party! Fantastic job!